There are various ways to convert integers to their string representation. 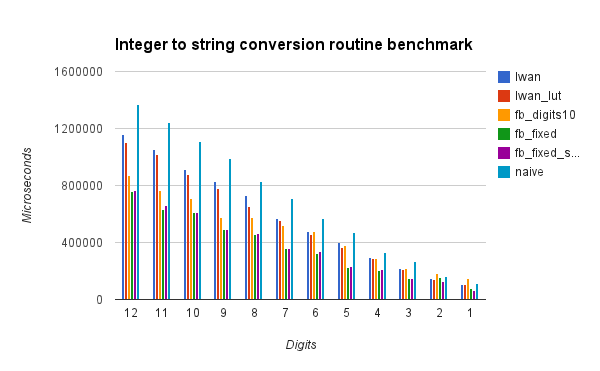 These conversions are rarely a bottleneck, but they often show up while profiling certain applications. For instance, they’re very common in Lwan while building the response headers. To use Lwan as an example: initially, snprintf() was used to convert numbers. Although this works, it is quite boring, performance-wise. The second approach was using the naïve algorithm, which basically divides the number by 10 in succession, writing backwards the result of modulus by 10 to a string, and then reversing the string when the number reaches 0. This was fine for a while, but that string reversion step always bothered me. Why not just write the string backwards already? I’ve then changed the code in Lwan to the following snippet. Note the nice trick of multiplying the size of an integer in bytes by 3 to obtain an approximation of the number of digits for MAX_INT, including the zero terminator, regardless of what sizeof(int) is. Reducing writes to the array made this algorithm significantly faster. However, I eventually did what one should always avoid when tinkering with this kind of thing: I’ve changed the array lookup to an addition, without measuring if it would perform better, and committed the code anyway. The lookup table is ~9% faster. Ouch! Last year, the Facebook Engineering team posted a function to convert integers to strings that manages to be even faster. They do use the same idea of avoiding having to reverse the string after they’re done converting each digit, and they use a lookup table as well. 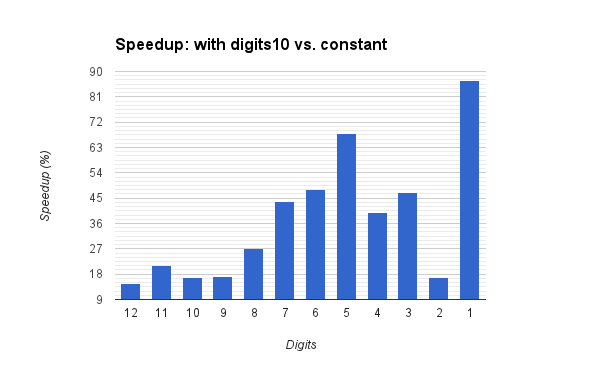 The digits10() function is also another function that calculates the number of digits of a number in a very efficient manner. Even being performant, though, one can get rid of the call altogether: using a constant like numeric_limits<uint32_t>::digits10 will keep the same interface. This is possible because the dst buffer should be large enough to hold all the digits of the largest 32-bit unsigned integer anyway. Results for snprintf() omitted to not skew results. Spoiler: it’s slow. Unfortunately, there’s a licencing issue that won’t let me use this code in Lwan. The blog post doesn’t mention the license. I’ve found this two-digit lookup table in places unrelated to Facebook as well, so I’m not sure who had this idea first. My go-to source of this kind of thing is usually Hacker’s Delight, but even then it’s not there.